Desktop sharing and Remote Assistance app for Windows 10. Softros LAN Messenger comes with simple and secure desktop sharing functionality. It is based on Microsoft's Remote Assistance technology and thus available on machines running Windows only. To access the desktop sharing features, follow these steps. Start a conversation with the user you would like to request assistance from or whose desktop you would like to connect to. On the toolbar of the Conversation window, click the Desktop Sharing button. Depending on what you need to do, click either of the two available options. Request Assistance from – allows you to ask the remote user to connect to your desktop. Remote into Computer – allows you to connect to the remote user's desktop. Click Request Assistance from. The following message will appear in the Conversation text box. If you need to revoke your request, click Cancel. The button will then turn into the status Canceled. Once the remote user has accepted your request, the button Cancel will turn into the status Accepted meaning the session has started. Additionally, a semitransparent dialog box notifying you about the session's status will be displayed on your desktop as long as the session is active. The box cannot be hidden, covered or closed without the session being interrupted. You can, however, move it across the screen. To finish the remote session at any time, click End Session in the status dialog box. Once you have ended the session, the status Accepted in the Conversation text box will change to Complete. Click Remote into Computer. 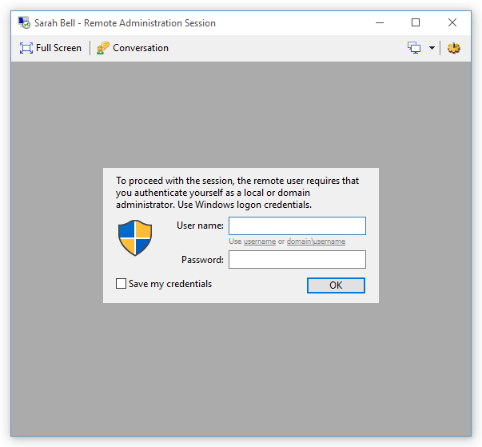 A remote session window will open on your desktop. If you need to cancel the session, click the Close button found in the top right-hand corner of the window. Enter the user name and password of an account that has administrative rights on the remote computer. This can be a local or domain administrator account and may not necessarily be the user account you are connecting to. Optionally, you can check the Save my credentials check box for faster logon later on. Finally, click OK.
After you have successfully logged on, a semitransparent dialog box notifying you about the session's status will be displayed on the remote user's desktop as long as the session is active. The box cannot be hidden, covered or closed without the session being interrupted. You can, however, move it across the remote user's screen. The following buttons are found on the toolbar of the remote session window. Full Screen – makes the window fill the whole screen. Conversation – brings the conversation you are having with the remote user to the foreground. Settings – gives you access to several viewing options. Auto Scale – makes the remote user's entire desktop fit into the remote session window. If this option is unchecked, the remote desktop will be displayed in its original resolution. Auto Scroll – allows you to scroll the remote desktop by simply moving your mouse to its sides. This option is enabled only if the Auto Scale option is unchecked. Keep Aspect Ratio – keeps the remote desktop's original aspect ratio within the remote session window. This option is enabled only if the Auto Scale option is checked. the remote user is offline. Use of the desktop sharing features can be restricted with the Admin.ini file. Microsoft's Remote Assistance technology requires access to dynamic ports allocated by the system in the range TCP/UDP 49152-65535. If those ports are not open on your personal firewall, router or VPN tunnel, the desktop sharing features may not work correctly.